QUICK & EASY ­­- I have revised and updated this popular one piece sweater that knitters have been asking for again. 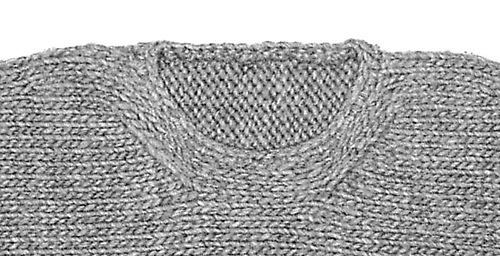 It is knitted from cuff-to-cuff with tapered sleeves and curved underarms. The front neck shaping is worked with decreases and increases (see photo below and page 2 of pattern). Sweater has optional crochet edging around neck, cuffs and hem. This sweater is a wardrobe staple worth having in more than one color, and it is a fast knit!